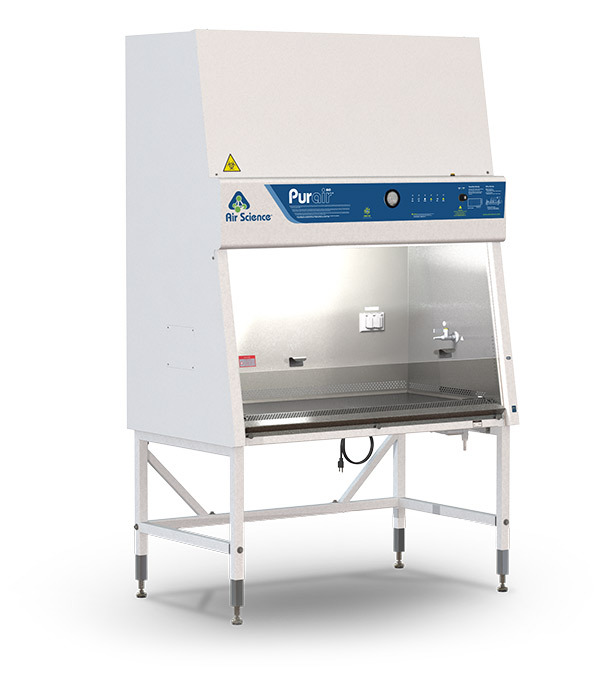 The new Purair Bio biological safety cabinet (BSC) is certified for safety and performance in accordance with NSF/ANSI Standard 49 and EN12469 which certifies Class II, Type A2 laminar flow cabinets are suitable for working with biosafety agents at levels 1, 2, 3, and 4. Air Science 4ft models are certified by NSF. Single EC blower motor design. The Purair Bio is designed with a single EC blower motor for ease of use, reliability and to promote low cost of ownership. Airflow adjustments are simpler, operational costs lower, and maintenance easier for BSCs equipped with single EC blower motors. Slim profile. The slim profile cabinet is one of the narrowest on the market. The compact width allows easy passage through standard doorways for easier installation and relocation. Ergonomic design. The user interface combines ergonomics, safety, and aesthetics to reduce operator eye strain and fatigue.